We'll get the pizza (and the dungeon) in a moment -- first, it's important to have a little bit of background. Before The Orchard was The Orchard, it was Gorman's Grill. Brendan Noonan, who has been researching the history of his father's tavern, told me: "After prohibition, a gentleman by the name of Gorman bought it. This is the story I've been told. The most common story is that this Gorman fellow was an Italian Jew who came to the US and was either left alone or came alone. And was adopted by an Irish policeman in Albany named Gorman." 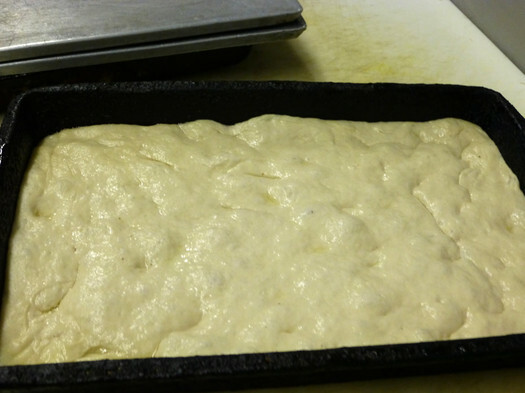 The Orchard pizza recipe was created by Gorman, an Italian immigrant. So when people suggest that the pizza served at The Orchard isn't Italian, the Noonans would beg to differ. "We have 70 year olds, 80 year olds, 90 year olds who had their first date here. Who came here after VI played CBA at Bleecker Stadium back in the 40s and 50s... and they say the pizza hasn't changed since the 40s." Brendan explains: "It's the same recipe. My father had to buy that recipe. We have 70 year olds, 80 year olds, 90 year olds who had their first date here. Who came here after VI played CBA at Bleecker Stadium back in the 40s and 50s... and they say the pizza hasn't changed since the 40s." "There used to be probably fifteen taverns and grills in this neighborhood alone. Because of the railroad shops. There were probably 8,000 people employed there in its heyday. And all these kinds of places sprung up. We're the last ones to be around. Not sure why, but we just try to keep it going. We're not really neighborhood -- neighborhood style, I guess -- we don't draw heavily from the neighborhood. It's a very transient neighborhood. But we have had people for a 100 years, families for a 100 years, that have come through here, and know us. And even if they move to the suburbs they come back here on the weekends and hang out, bring their kids and grandkids, and I think that's unique to us." These days pizza is the thing at The Orchard Tavern. Mike told me they do about 1,000 pizzas a week on average. As Brendan said, "It's our bread and butter. It's why we're here." But back to the dungeon. Based on the design of its construction, this chamber looks like it was built in the 1940s. That would be consistent with the arrival of Gorman. It is effectively a small, confined room in the basement where the dough gets made daily. Its stark walls are lined with linoleum. The tools are simple. A large bucket of flour, an industrial mixer, and a sink. On the one shelf are smaller containers of yeast, sugar, salt, and oil. There is also a space heater bolted to the floor to keep the dough at a consistent temperature. Some pizzas are special because of the oven they are cooked in. Others are notable for their ingredients. The Orchard pies couldn't be made without their pans. These rectangular forms are seasoned with years and years of love. 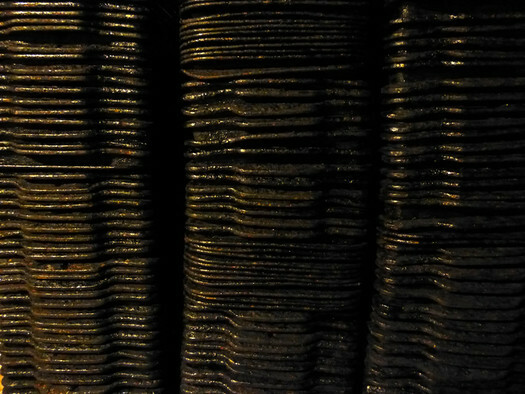 They are brushed with oil, and after the dough is rolled out, it is pressed into the pans to rise. The filled pans start off in the cool of the basement, and then are moved up next to the oven where the heat activates the yeast. When the dough has risen just enough, the pans get moved over to the pizza station so they can get seasoned, sauced, and topped. White pizzas get a shake of garlic powder before being brushed with a mixture of oil and chopped garlic. Red pizzas get a shake of garlic powder before receiving a small ladle of housemade tomato sauce. Like the dough, the sauce is made from the same original recipe. It starts its life as canned whole tomatoes and simmers slowly in a giant pot on the back burner of the stove in the kitchen. 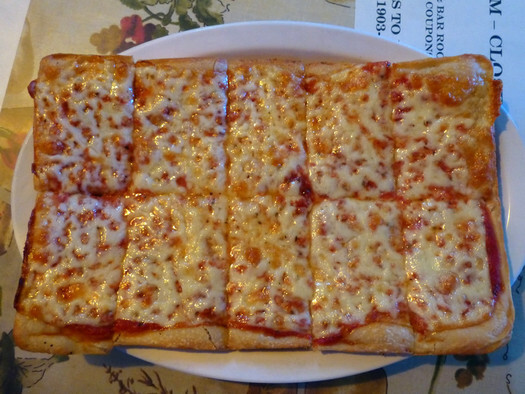 However, more than anything else, it's the cheese that helps to identify the style of this pizza. "The cheese is block cheese from Wisconsin that they stopped making and we literally had to beg them to keep making it." Brendan tells the story: "The cheese is block cheese from Wisconsin that they stopped making and we literally had to beg them to keep making it. This was like five years ago, and for some reason they decided to listen to us. We're like one of two or three people in the entire country who use this specific kind of cheese... It's just cheddar." Three large rectangular slices of this mild, creamy cheddar cover the pizza pan from edge to edge. There is also shredded mozzarella in the kitchen of The Orchard. So if you really want a more traditional cheese on the top of your pizza, it's available. But it's so infrequently requested that it's tucked away in a refrigerator, separate from the rest of the pizza toppings. And from there the pizza goes into a standard double decker pizza oven set to a relatively low (for pizza) temperature of 450 degrees. In the pan the oily, yeasty crust almost gets fried to produce a light and crisp exterior. There is even a specially made spatula that fits perfectly into the pan and lifts out the pizza that's quickly cut in half lengthwise. Then four quick perpendicular cuts divide the pie into ten small rectangular pieces, which are then carefully slid onto the plate. The standard Orchard pizza is doughy and the Noonans have no interest in changing it. But you can order your pizza well done. Brendan explains what that means: "We take it out of the pan and put it right flat on the oven for about two to three more minutes. And it's just crispier. The dough gets a little crispier. I like it that way as well." Even still, the middle pieces go from light and crisp to soft and doughy on the plate awfully fast. I'd recommend eating the pizza from the middle first and saving the crispy corners (that stay crispy the longest) until the very end. If I were going to ascribe a style to this pizza, it would be closest to the pies of Pennsylvania's Old Forge outside of Scranton. It's very possible that this piece of coal mining culture made its way up the railroad to Gorman's Grill. Or maybe it was Gorman's unique pies that seeded the style down in Pennsylvania. The answer is likely lost in time. But the important part is that this piece of Albany's culinary history survives and continues to nourish generations of Capital Region residents. This is great! I love The Orchard, but haven't been in a while. I'm putting it on the top of my docket. Great writing, DB (history and food are my two favorite things)! Love the Orchard! The folks there are very sweet and the place oozes history. As vegans, we stop by for whiskey and fries, but good on you for spreading the word about their special pizzas. I am amazed by the number of locals who haven't heard of the joint. They don't seem to be hurting for customers, but also don't seemed upset when newcomers like us show up. Very nice description and it makes me want to try the pizza. One fine point, you don't need warm temperature to activate the yeast... it just works more slowly at lower temperatures. The popular style of baguette in Paris these days (ironically called "traditional" even though it's a recent invention) starts with a long resting time for the dough in the refrigerator. This gives it an extra complexity which probably helps the taste of the Orchard dough as well. The pizza is def "hip to be square"... It is on my favorite list!!! Been consistently great since I can remember. The Noonans are the best and they bust their asses on a daily basis. Great shout out Daniel Berman! To each his own when it comes to pizza, I guess. A doughy crust with cheddar sounds appalling to this downstate-born gal. 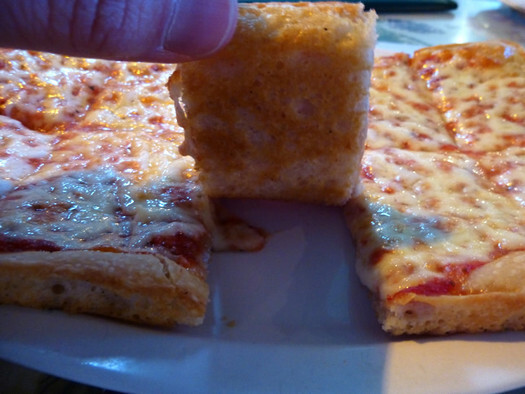 It is too bad that Citone's isn't still around, they had great pizza! They also had amazing Sicilian steamed clams. Glad you finally got around to liking this amazing pizza since your very average Yelp review from awhile back. It really is something special and distinctively local. This story makes me miss my grandparents, immigrants from Sicily who arrived at Ellis Island ca. 1920. 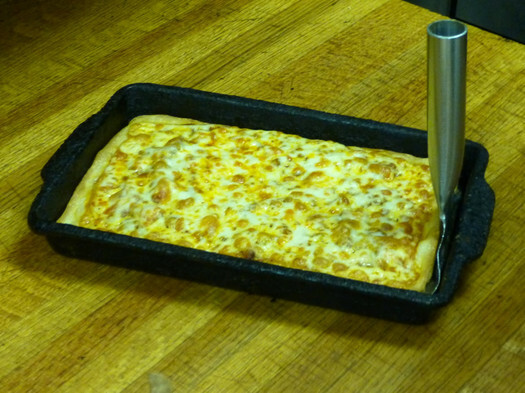 My grandmother made pizza in a well-seasoned pan that looked much like what the staff use at the Orchard. She always baked her crust until crispy. Sadly, I never studied how she made it, but my mother did get Grandma's recipe for sauce. Thanks, Daniel, for stoking these memories and putting the Orchard on my list of places to try. I'm not a native Albanian, so it takes stories like this one to educate me. I have been enjoying the Orchard's pizza for 50 years! It is so good, but you need to try the wings, burgers, reubens & chicken parm too. Nice beer selection too! Every time I go there, which is a lot, I think I'll try something new but I end up with a pizza because it's outstanding! The Orchard lives! I'm in California now but lived in Albany from 1960 - 1970, graduated Albany High in 1968. My friends and I used to go to The Orchard for pizza after football or whatever, and I've never forgotten that pizza or had anything like it since. Finding this article, complete with photos showing their signature rectangular pizza really took me back ... made my mouth water. That golden, crispy crust! It's a whole different experience than the big doughy things cranked out in chain pizzerias. Knowing The Orchard is still open and using the same recipe makes me want to book a flight to Albany. Thanks for a great article! 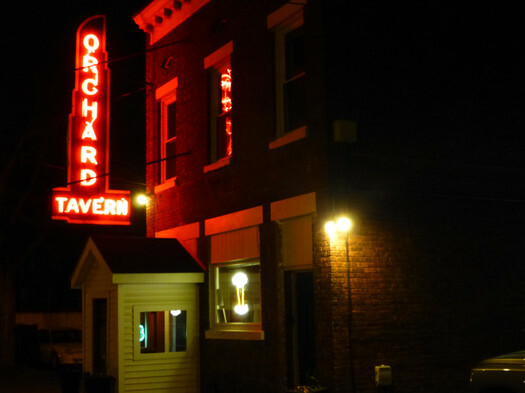 I grew up in albany, graduated from vI, and had some some of my best memories at the orchard. I've lived in several states in the us and never came across any pizza like the orchards. My mouth is watering just thinking about it. I must be an outlier here, I don't like the Orchard's pizza at all. BUT, this is more important - the Noonan family are a truly wonderful bunch of folks. I go there for the beer & company & skip the pizza. There's plenty not to like about old Albany but the Noonans are an example of old Albany at its best.